When life gives you lemons, weaponize them. Model maker and Portal 2 fan Chris "Ammnra" Myles - the man who built the fantastically detailed personality spheres - is at it again, and this time he hasn't just recreated something from the game, he's actually made something new based on it instead. Those of you have played through Portal 2 - and those of you who haven't should turn back, lest ye encounter spoilers - might recall that Aperture founder Cave Johnson isn't a big fan of the saying, "If life gives you lemons, make lemonade." In fact, he gets so angry about the lemons, he threatens to invent a combustible lemon and use it to burn down the homes of the lemon bearers. What Myles has done, is envision what it might have looked like if Johnson had been successful in his efforts to construct a firery lemon. 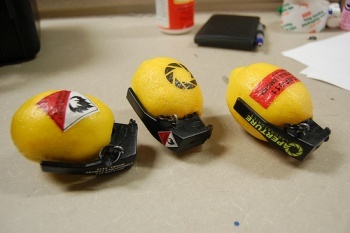 The combustible lemons are made from fake lemons, parts from BB loaders, springs that allow the handle to fly off when the pin is pulled, and a hacked greetings card that plays Johnson's lemon rant, and then a loud boom. While you won't find lemon grenades in the game itself, they'd be a great fit. Lemons grenades are pretty much the perfect combination of the surreal whimsy and dark humor that the Portal games do so well. You can check out the lemon grenades, as well as a bunch of Myles' other projects, on his Flickr page.